In the early 1980s I spent two years working at the Kapteyn Astronomical Institute in the Netherlands. One of the members of staff there was a radio astronomer named Seth Shostak... the same Seth Shostak who went on to worldwide fame at the SETI Institute. But back in those days, Seth's day job was counting neutral hydrogen atoms in distant galaxies -- the search for extraterrestrial intelligence was just a glimmer in his eye. 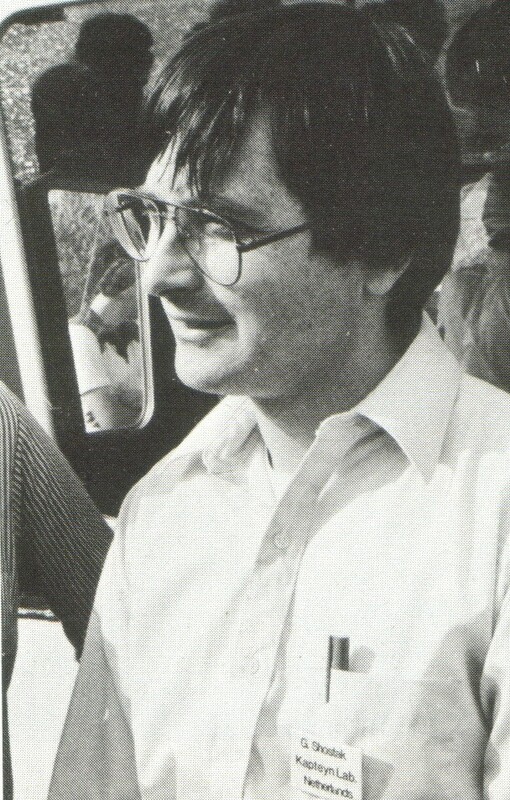 In June 1983 the Kapteyn Institute hosted a symposium on the subject of the Galaxy, and Seth was invited to give an after-dinner talk one evening (the picture on the left is taken from the Symposium proceedings, not his High School yearbook -- Seth always manages to look twenty years younger than he really is!). The title of his talk was " Life in the Galaxy?"... in other words, SETI. Seth told me recently that he's always considered that this was the first real talk he'd ever given on this subject -- which means I was present at a truly historic event, even though I didn't realize it at the time! The talk was delivered in light-hearted style (Seth placed a telephone on stage with an upward-leading cable, just in case any extraterrestrials wanted to phone home), but it covered all the serious SETI topics like radio searches, spectral analysis and the Fermi Paradox (aka "Where are they?"). As Seth said: "There has been plenty of time for an ambitious group of aliens to colonize the entire galaxy... thus the aliens should have been everywhere, including our own solar system. Now, the followers of von Däniken believe they have been here, and the UFO crowd thinks they still are. But the hard-headed, irrefutable evidence is missing. No-one has as much as an ash-tray from an alien spaceship. Fact A of the SETI business is that we seem to be alone, and we shouldn't be." Seth also mentioned Carl Sagan's Pioneer plaque, which he pointed out "might have the wretched luck to make our presence known to an aggressive culture which will destroy civilization to obtain our chlorophyll or other commodity. In this view Carl Sagan may be destined for eternal fame as the man responsible for the obliteration of earth. But a hundred thousand years is a long time, and Carl isn't worried: Après moi, le deluge."